This How To Make Perfect Shrimp Kabobs Article was featured on EzineArticles.com in June 2009. The next grilling tip is to soak wooden skewers for approx. 1 hour prior to using them on the grill. This prevents them from burning. Find a large enough pan to fit them into and cover them with water. You can place something on them to hold them down in the water or swish them around several times during the soak. Third tip, when skewering the shrimp, leave plenty of room on the end of each skewer to be able to grab them, this also prevents the shrimp from falling off the ends when you flip them. 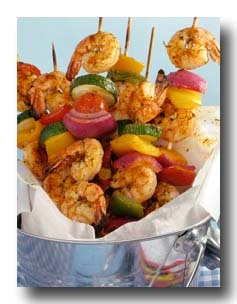 If making grilled shrimp recipes that don't call for skewers, I prefer to use a Weber 11.75-in. Grilling Basket for shrimp. It is a metal basket with holes. It allows the flames to come through and conveniently holds the shrimp inside, preventing them from falling into the grill. (These baskets can be a dinner saver!) Each time I use the basket I give it a spray with the PAM cooking spray for grills. Keeps the food from sticking. Another tip is the grilling temperature. A medium to high heat usually works best. And the last and most important tip (no matter how you are cooking it) always watch the amount of time you cook it. You do not want to over cook shrimp. Directions: Mix marinade ingredients together and marinate shrimp for about 4-6 hours prior to cooking. After marinating shrimp, soften butter and mix with coconut milk, shredded coconut, and dark rum, if desired. Blend together well. Skewer shrimp onto skewers, adding a pineapple cube in between every other shrimp. Cook over open flame or under a hot broiler 3 to 4 minutes on each side. After turning once, brush with butter mixture. Continue cooking until done. That's all there is to it. Fire up your grill and enjoy. This article is brought to you by Beth Brawn, creator of https://www.free-shrimp-recipes.com You can visit her website for many more delicious Grilled Shrimp Kabobs recipes along with many other shrimp cooking tips, cooking videos and more great recipes. Copyright- You may freely republish this article, provided the text, author credit, the active links and this copyright notice remain in place.